Chengde situated 250 kilometers to the northeast of Beijing, is a tourist city with graceful scenery, a wealth of scenic spots and places of cultural interest, and a perennially pleasant weather. 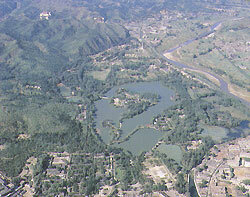 The Summer Mountain Resort, a celebrated imperial garden, is found in the north of the city. The mountain resort was first built in 1703, and after 89 years of painstaking efforts through the Kangxi, Yongzheng and Qianlong reigns, had grown into the world's largest classical imperial garden that occupied a total area of 5.64 million square meters, or twice as big as the Summer Palace of Beijing and eight times as big as the Beihai Park. In 1994, the special global cultural and natural value of the Summer Mountain Resort of Chengde and the temples around it was confirmed when the UNESCO listed the resort and the mountains around as world cultural heritage. Because of this resort, Chengde itself was among the first group of Chinese cities to be designated as a famous historical and cultural city, one of China's ten major scenic resorts, and a key natural scenic zone. 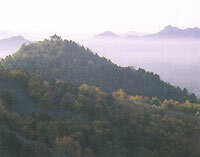 First, Chengde is providently endowed with a picture-perfect landscape and a pleasant climate. The landscape is typical of north China, yet it contains elements of scenery in the lower Yangtze valley. In summer the weather is especially cool and pleasant. The place is studded with peaks and boulders of a hundred and one exotic forms. The grassland unfold like a huge green carpet, rivers run in all directions, and the forests are boundless. With the beauty of lakes, plains, highlands and mountains, Chengde was an ideal site for the construction of imperial gardens. Secondly, in order to tighten up its control of border regions, the Qing emperors built summer palaces and imperial temples in Chengde for the purpose of pacifying local minority ethnic people and consolidating the northern defense line. 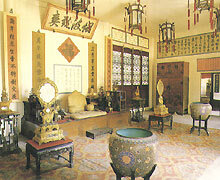 The entire resort is a veritable museum of ancient Chinese garden culture and horticulture. 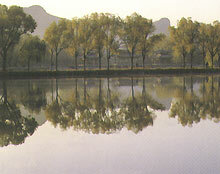 The West Lake of Hangzhou, the Gentle Waves Pavilion of Suzhou, the Jinshan Temple of Zhenjiang, the Pavilion of Smoke and Rain of Jiaxing, the Tianyige Tower of Ningbo, etc, have all found their replicas in Chengde, and there are also artistic renditions of the Changbei Mountains of the northeast, the plateau of the northwest, the prairies of Inner Mongolia, and the water-bound scenes south of the Yangtze. In its heyday the mountain summer resort was strewn with 72 places of scenic beauty that may well be regarded as a microcosm of the charming landscape of China. During the Qing Dynasty, seven emperors beginning from Emperor Kangxi, had visited the mountain resort, where they handled state affairs, received leaders of minority ethnic peoples and foreign diplomats, so much so that Chengde had become the de facto second political center of China. Chengde is the venue of many major historical events, which have bestowed a wealth of materials for the study of Qing history. The Mountain Summer Resort of Chengde is found in a long and narrow ravine by the Wulie River in the Yanshan Mountains. The resort itself is enclosed with a 10-kilometre-long, 13-metre-wide stone wall that runs up and down the terrain in a way reminiscent of the Great Wall. The resort itself falls into two parts, palaces and gardens. The garden zone, which extends from southeast to northwest, is divided into three scenic parts: lake, plain and mountains, which are clustered with 120 buildings and 72 scenic spots. With gardens contained in gardens, and scenery in scenery, the entire resort forms a richly variegated, three dimensional picture scroll. 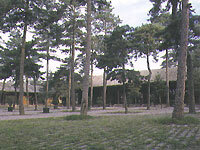 The palaces are in three building complexes. First, the main palaces arranged symmetrically on an axial line, with three gateways and the main palace, the Danpojingcheng Hall, forming the front and a number of courtyards forming the residential quarter for the emperor and his harem. Second, the Pine and Crane Chamber, where the Empress Dowager stayed in summer. Situated on the eastern side of the main palace, the chamber is slightly smaller than the main palace and consists of eight courtyards. Third, the eastern palace, situated to the east of the Pine and Crane Chamber, and its main structure, the Tower of Clear Voice, was a three-floor theatre which was destroyed in 1945. The Danpojingcheng Hall of the frontal palaces covers an area of 583 square meters. Its window panels, partitioning walls, and screens are inscribed with such patterns as bats and crocket and such Chinese characters as "wan" and "show". Because it was rebuilt with nanmu wood in 1754. or the 19th year of the Qianlong Reign, it is also known as the "Namnu Hall". In times of rain the namnu wood would emit a heady fragrance. 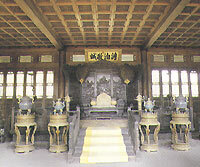 This was where Qing emperors held courts and major ceremonies and received generals and officials, leaders of ethnic minority peoples and foreign diplomats. Hanging on the central wall of the hall is a horizontal board inscribed with four Chinese characters in the handwriting of Emperor Kangxi that are meant to remind the monarchs to live a thrift life in honour of their lofty political aspirations. Kangxi built the Mountain Summer Resort for a political purpose, and that is why he avoided unnecessary pomp and pageantry in architecture. All the windows and doors were built of nanmu without being painted, which is totally different from the style of palaces in Beijing. The lakes are at once linked and separated by sandbars, isles, dykes and bridges into the Changhu. Chenghu. Ruyihu, Shanghu, Xiahu, Yinhu and Jinghu lakes. There are eight isles on the lake that are linked with dykes and bridges and decorated with quite a few pavilions and chambers. Most of these buildings are imitations of houses found in the lower Yangtze valley. The lakes which are overgrown with reed, combine to form a vast expanse of water, and the dykes and banks wind their way through a series of sandbars and isles. A cruise on the lakes brings the visitor in contact with the scenery of this world of water.